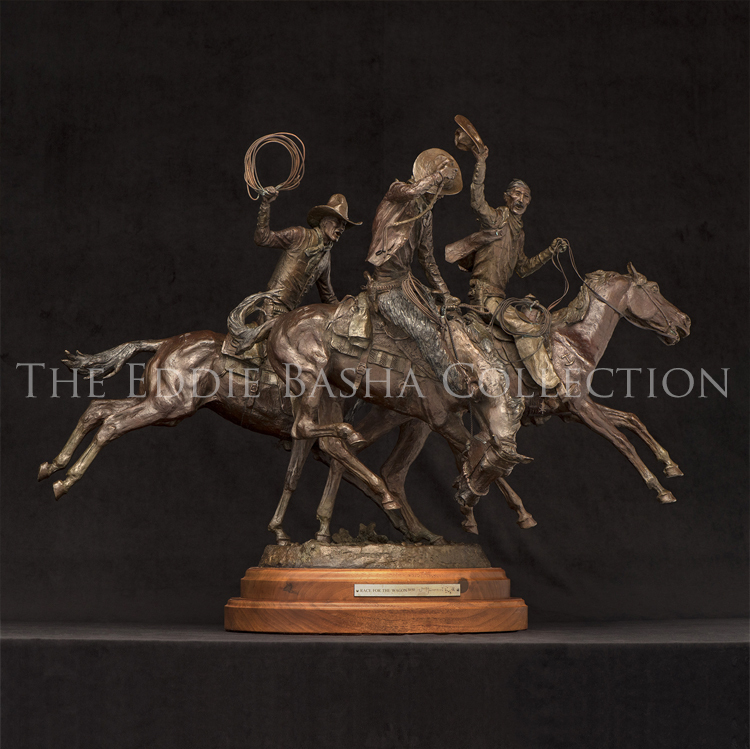 Well into his eighties, John Hampton, one of the founders of the Cowboy Artists of America, was still painting, drawing, and sculpting the many stories of the American West. 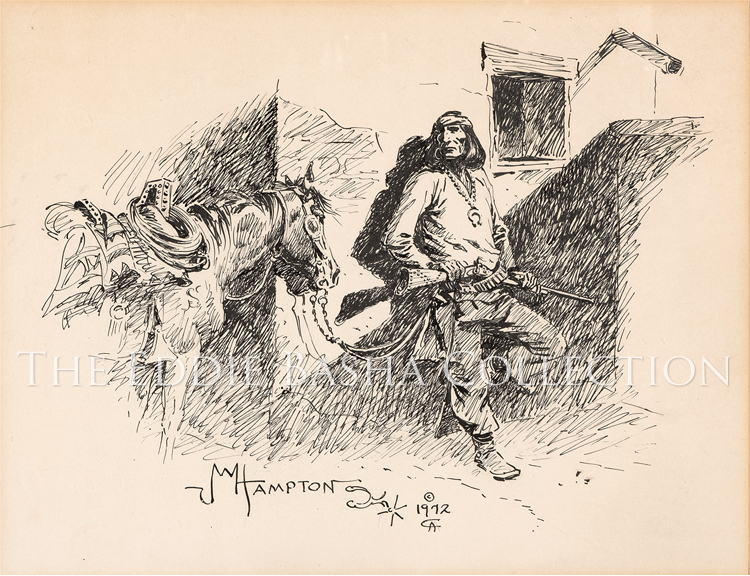 Hampton was born in Brooklyn, New York in 1918, but made his way west at an early age. As a boy, he had shown an early aptitude for art and won a drawing contest sponsored by the New York World Telegram. 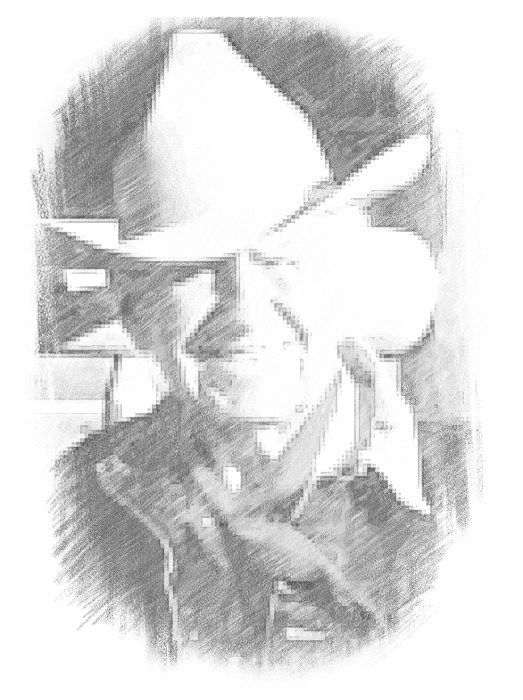 Years later, while he was working as a cowboy in New Mexico, one of his cow bosses told him that he had the makings of a good cowboy, but an even better artist. Hampton combined those two pursuits for the rest of his life. One of his early jobs was working as an illustrator for newspaper comic strips, including Fred Harman’s Red Ryder and Little Beaver. Hampton felt close to the Western life that he portrayed in his paintings and sculptures. 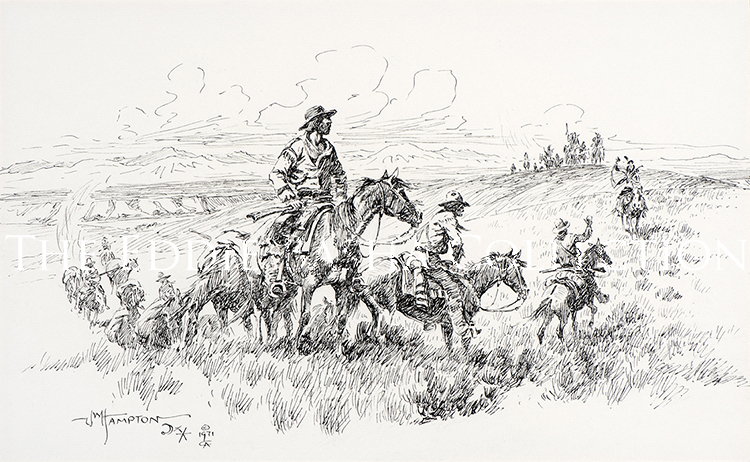 In addition to working many years as a cowhand, he continued to keep his cowboy skills well-honed even after he turned to art full time. Hampton felt a deep affinity with the historic West. He once said, “I was born a lot closer to the last center than the next one.” Hampton’s artwork is now in many museums, including the National Cowboy and Western Heritage Museum in Oklahoma City, Oklahoma; the National Center for American Western Art in Kerrville, Texas; and the Montana Historical Society in Helena. In 1965, Hampton got together with Joe Beeler, Charlie Dye, and George Phippen in Sedona, Arizona, to talk about the need to preserve and promote the art of the American West. As Hampton later recalled, “We didn’t feel the necessity to wait around and let the Eastern critics tell us what was worth painting in the West.” For thirty years, Hampton was an integral part of the development of the CAA. He remained one of the organization’s spiritual leaders from its inception until his death in 2000. During those years, the organization grew to become the leading light in the genre; a light that Hampton helped ignite with the help of three like-minded friends. In the small yard in his Brooklyn boyhood home, John Wade Hampton practiced roping cows with his mother’s clothesline. 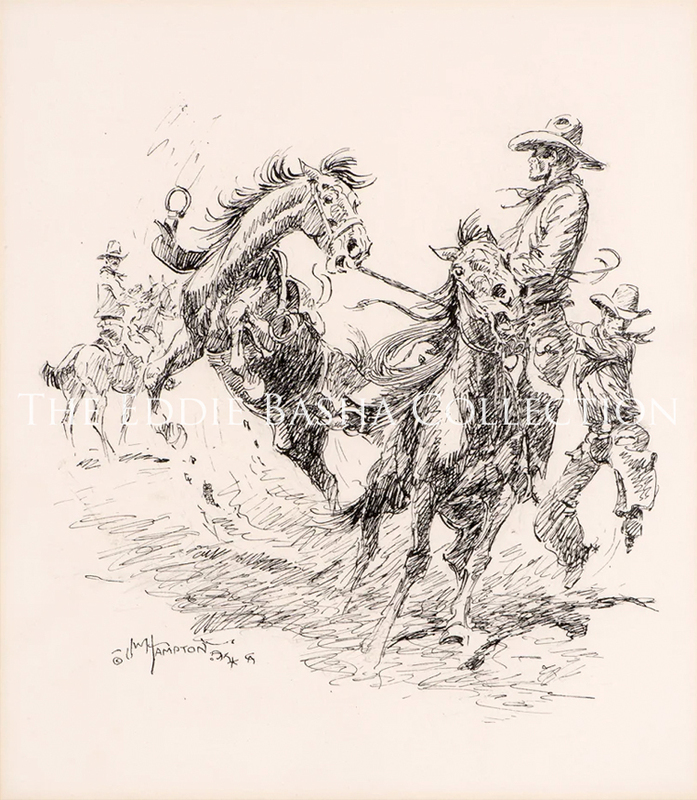 With earning from the “Red Ryder” comic strip, which he helped draw, Hampton moved West to Scottsdale, for a time, where he raised and punched a few head – mostly as models for his art – and helped found the Cowboy Artists of America. 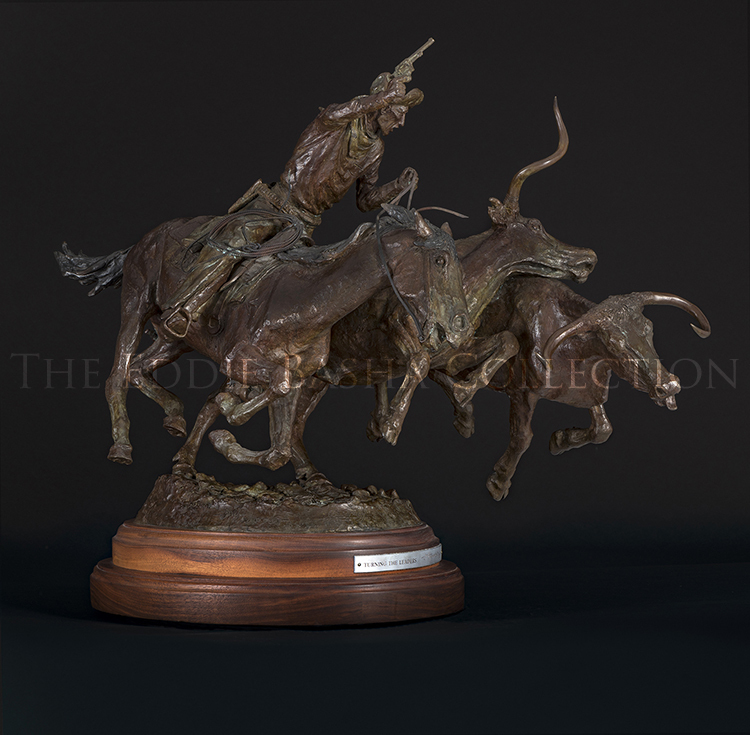 In the mode of Remington’s Coming Through the Rye and countless others, Race for the Wagon is Hampton’s entry in the “hell bent for leather” Western bronze motif, whose unstated goal seems to be to make the cowboys and horses appear to fly as if on air. Hampton’s nifty solution anchors the rear legs of the front horses and the front legs of the rearmost horse on a small round base so that at least half of each horse is unsupported. Having the horse nearest us bow his head allows us to see through the composition. The cowboys seem to levitate between strides.